News - Crush & Varma Law Group P.C. April 7, 2018. Our partner, Vikas Varma, who works with numerous startups and IT company clients, participated in the India Business Conference 2018 at Columbia University, organized by Columbia Business School. The event was thought provoking and inspirational, and was attended by many startups and budding entrepreneurs. Mr. Varma was able to catch up with old friends, and had the special opportunity to dialogue with Mr. Salman Khurshid, former Minister of External Affairs, India (shown here). November 9, 2016, Newburgh, NY. Maureen Crush will be teaching several segments of an all-day program “The Probate Process from Start to Finish” for the National Business Institute, including “Initial Filing in Probate Court and Estate Timeline” as well as “Law of Intestate Succession”. Maureen Crush will be presenting a talk "Resolving Conflict Without Litigation"
October 18, 2016, NYC, NY. For the third year, the New York State Bar Association has asked Maureen Crush to participate and present two segments of its day-long program “Representing the Startup Venture” in New York City, to be held on October 18, 2016. Maureen will be speaking about “Choosing the Right Legal Entity for a Startup Business” and “Corporate Shareholders’ Agreements and LLC Operating Agreements”. Maureen Crush will welcome the new Leadership Orange Class of 2017. September 28, 2016. Maureen Crush will welcome the new Leadership Orange Class of 2017 at their Class Orientation. She will participate in the day long program, running sessions of team building activities designed to bring the Class together quickly. She will also be recognized that evening at the Leadership Orange Pinnacle Event for her six years of service on its Board of Directors. September 19 and 20, 2016, Poughkeepsie, NY. Maureen Crush will be speaking at the National Business Institute 2-day seminar on September 19 and 20, 2016 in Poughkeepsie, NY - “Estate Planning from A to Z”. Her presentation segments will be “Key Elements of Successful Wills” and “Business Succession Planning”. Vikas Varma to Serve on the Board of Directors of Leadership Orange. July 2016. Vikas Varma, a Leadership Orange graduate from the Class of 2011, was asked to serve as a Director for the Leadership Orange Board of Directors, and began service in July 2016. Leadership Orange exists to educate current and emerging leaders, both youth and adults to foster their involvement in Orange County and become catalysts for positive change. Maureen Crush will be a Delegate to WBASNY and Member of the Board of Directors of the Women’s Bar Association of Orange and Sullivan Counties, Inc.
June 16, 2016. Maureen Crush was installed as a Delegate to WBASNY and member of the Board of Directors of the Women’s Bar Association of Orange and Sullivan Counties, Inc. She continues to serve as a Founding Director and officer of the Women’s Bar Association of Orange and Sullivan Counties Foundation which provides scholarships and educational programs in support of woman attorneys. May 24, 2016. Associate Debra Burg was sworn in as a Director of the Mid-Hudson Women’s Bar Association, by the Honorable Christine A. Sproat, Justice of the Supreme Court Dutchess County. Deb is serving her second term as a director. MHWBA is one of 19 Chapters of the Women’s Bar Association of the State of New York. Its mission is to promote the advancement of the status of women in society and of women in the legal profession; to promote the fair and equal administration of justice; and to act as a unified voice for its members with respect to issues of statewide, national and international significance to women generally and to women attorneys in particular. Maureen Crush to Serve on the Board of Dutchess Tourism, Inc. In January 2016 Maureen Crush accepted the opportunity to serve on the Board of Dutchess Tourism, Inc. – one of the premier tourism organizations in the United States the mission of which is to bring tourism dollars to area businesses by marketing and promoting the assets of Dutchess County to the nation and the world. New E-Filing Available For CHAR500 With Charities Bureau. New York State. March 2016 - Charities Bureau is offering registered organizations and preparers the opportunity to file the CHAR500 Annual Financial Filing through Form 990 Online. Vikas Varma honored as Orange County Rising Star!! Tuesday, October 8, 2013 - Vikas Varma honored as Orange County Rising Star!! Thanks to Leadership Orange, Junior League of Orange County and the Orange County Chamber of Commerce for putting together a great evening for our Rising Star. Maureen Crush to deliver keynote presentation on "Buying and Selling a Small Business" at SBA Days. Thursday, April 18, 2013 from 11:30 am - 1:00 pm - Maureen Crush will deliver the keynote presentation on buying and selling a small business at SBA Days on April 18, 2013 - sponsored by KeyBank. The program will guide attendees through the entire process - from choosing a business to buy to closing the final deal. Location: At KeyBank, Oakwood Commons, 2515 Route 9, Poughkeepsie, NY. No cost to attend and open to all. Register by calling Whitney at the Dutchess County Chamber of Commerce 845-454-1700 x1000. Maureen Crush to panel the open forum and panel discussion on first home purchase. January 9, 2013 - Maureen Crush will be a panelist in a half-day seminar: “Don't Let it Happen - Fraud! How to Prevent It, How to Report It, Legal Rights & Responsibilities”. The seminar will present real-life case studies and information on topics such as assessing your business vulnerability, how financial fraud is committed, profile of a perpetrator, latest cyber advances in evidence gathering, working with law enforcement, reputation management, preservation of evidence and criminal prosecution. Time: 8 am to noon on January 9, 2013; Orange County Chamber of Commerce, 30 Scott’s Corners Dr., Montgomery, NY. PE/CLE Credits are available. For Registration Information: mcrush@deramoncrush.com or 845 897 3400. Special cyber security equipment demonstrations at 8 am. Maureen Crush will be teaching a seminar for NYSBA: "Buying or Selling a Small Business"
Maureen Crush will facilitate a seminar of the Community Foundation of Orange & Sullivan: "Practical Approaches to Guiding Your Clients"
October 3, 2012 - Maureen Crush, and Andrea Reynolds, Executive Director of the Community Foundation of the Hudson Valley, will jointly present a continuing legal education program for the Dutchess County Bar Association at The Poughkeepsie Grand Hotel. Maureen Crush presented with the Root/Stimson Award. 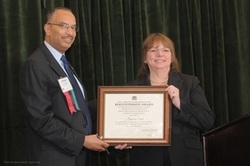 June 23, 2012 - Maureen Crush was presented with the Root/Stimson Award by the New York State Bar Association during its House of Delegates' meeting in Cooperstown, New York on June 23, 2012. In the spirit of Elihu Root and Henry L. Stimson, for whom the award is named, this award recognizes members of the legal profession who have given unstintingly of their time and expertise in service to the community. Ms. Crush was nominated for this award by The Women's Bar Association of the State of New York which application was in turn supported by numerous organizations including Habitat for Humanity of Greater Newburgh, Independent Living, Inc., A Second Chance, Inc., the Orange County Bar Association and the Women's Bar Association of Orange and Sullivan Counties. Maureen Crush will be teaching segments of a seminar entitled "Estate Administration Procedures: Why Each Step is Important". Maureen Crush will be teaching one-half of a full day seminar entitled "Top 10 Estate Planning Techniques". June 25, 2012 - Maureen Crush will be teaching one-half of a full day live seminar entitled “Top 10 Estate Planning Techniques” on June 25 at the Hilton Garden Inn in Newburgh, NY through the National Business Institute; register by calling 800.930.6182 and asking for program #59151ER or through this link Top 10 Estate Planning Techniques. Maureen Crush graduated as a member of the Leadership Dutchess Class of 2012. June 11, 2012 - Maureen Crush graduated as a member of the Leadership Dutchess Class of 2012 at a ceremony at Villa Borghese in Wappingers Falls, NY. Maureen Crush was a speaker at the seminar entitled "Helping Your Client Select the Best Entity Option". June 6, 2012 - Maureen Crush was a speaker at the seminar entitled “Helping Your Client Select the Best Entity Option” at the Hilton Garden Inn in Newburgh, NY through the National Business Institute. Maureen Crush serving as a panelist at "Wares & Wisdom". May 2, 2012 – Maureen Crush will serve as a panelist at the WOMEN'S LEADERSHIP ALLIANCE of the DUTCHESS COUNTY REGIONAL CHAMBER OF COMMERCE table top expo at the Poughkeepsie Grand Hotel; info: www.wlahv.org. Maureen Crush teaching seminar: "Y Women Matter – A Women's Expo". April 19, 2012 – Maureen Crush will be teaching a seminar at the GREATER NEWBURGH YMCA's expo, at Anthony's Pier 9: "Move Your Home Business to the Next Level - Legally"; info: mstang@newburghymca.org. Vikas Varma helps businesses work. March 30, 2012 – Poughkeepsie Journal features Vikas Varma as the business lawyer helping business in Hudson Valley. March 24, 2012 – Maureen Crush was sworn in as Treasurer of the Women's Bar Association of the State of New York: http://www.wbasny.org/content/board-directors. 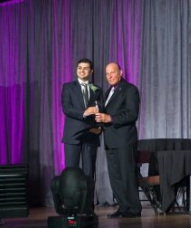 Vikas Varma honored with 40 Under 40 Shaker Award!! 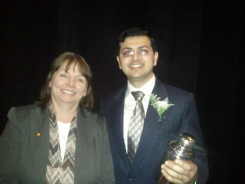 March 19, 2012 – Vikas Varma honored with 40 Under 40 Shaker Award. The Dutchess County Regional Chamber of Commerce selected this years’ crop of Young Professionals to be presented with a Shaker Award. Selected from a pool of over 100 applicants, and bestowed annually to 40 people under the age of 40 who have shown a strong commitment to the Hudson Valley, the Shaker Awards honor the next generation of leaders in our region, and encompasses a wide spectrum of professions.